Large, ruffled & speckled blooms in double flowered forms and a mix of colours. Incredibly tough whatever the weather & so easy to grow. Flowers from February - April they are a must for every spring garden! Supplied as a pack of 6 x 9cm plants, being double ruffled-flower types, all being unique colours as they are seed-raised and thus a random mix. 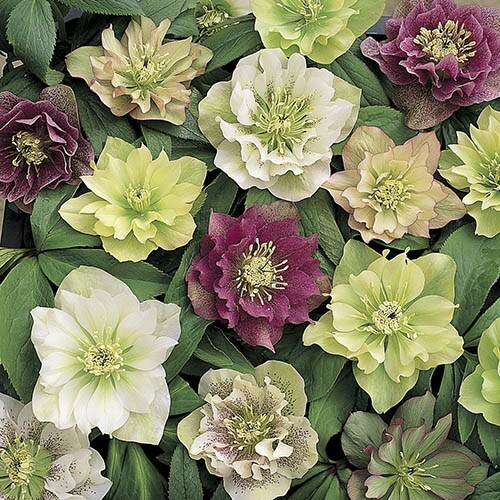 The Most Beautiful Winter-Flowering Plant - and so on trend too - Hellebore Double Queen mix. This collection features Large, Ruffled & Speckled Blooms in double flowered forms - every one is totally unique because it has come from seed! Adding delightful colour to your winter garden, these beautiful blooms, each of 2-3in diameter, are dainty to look at but incredibly tough whatever the weather! Hellebores are perfect for brightening your garden in late winter when other plants are still slumbering, and they make an ideal accompaniment to spring bulbs. Their cup-shaped blooms provide a valuable nectar source for early pollinators and are a favourite with furry bumble bees when they are woken on a warm spring day. Each collection includes a mix of 6 double flowered, 2-year-old plants; you will get a stunning mix of colours, many with speckles and darker edges to their petals. With flowers from February - April they are a must for every spring garden! So easy to grow, they will slowly establish into small clumps, increasing in flower number year after year - it is not uncommon to have upwards of 50 flowers in around 5 years. They thrive out of direct sun, preferring to grow in rich, well-drained soil in dappled shade - hellebores are essentially a woodland plant, so thrive in soil that is humus rich and moist. They can also be grown in pots if space is limited, provided they do not dry out in summer. Remove the old leaves in late winter or early spring as the flower buds emerge so that the flowers can be seen. Plant in rich, well-drained soil in dappled shade and Provide shelter from strong, cold winds. Plants are not happy if left in very dry or waterlogged soil so incorporate plenty of well-rotted organic matter into the planting hole along with some horticultural grit if the soil is heavy. Water regularly during dry spells and mulch annually with leaf mould, chipped bark or other organic matter in autumn.